does the booking need to be inside the time period... or can you book now for lets say november? does the booking need to be inside the time period... or can you book now …does the booking need to be inside the time period... or can you book now for lets say november? It's book before. Not travel before. AFAIK (and what it says on the voucher) you can book next year (although it does expire after a year). T&C don't mention anything. You have to actually go to get discount though. So if it is a pay at property hotel stay it wouldn't be eligible ? Does this voucher code expire? I already bought tickets to Santorini and need to reserve a hotel but can't do it in next few days. So I am wondering if I can use it next week as well? 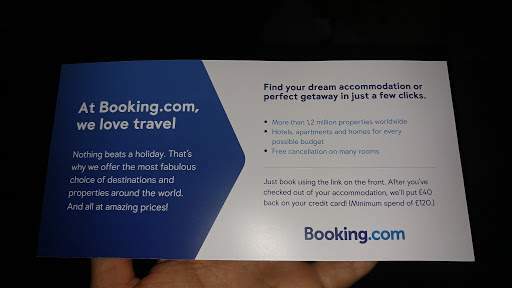 Wow, didn't expect to find better than a 10% discount code when searching for booking.com coupons. This is brill! £40 off my £139 hotel, thanks so much OP! I wouldn't trust booking.com to honour this. 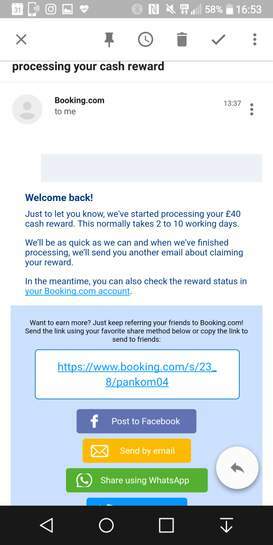 I booked a hotel with them where I was promised £15 cashback for going through a link provided by a friend and they said it had tracked through Quidco so wouldn't pay. Load of nonsense - I had gone through the link provided and whether it had tracked with QUidco had nothing to do with it. I wouldn't trust booking.com to honour this. I booked a hotel with them …I wouldn't trust booking.com to honour this. 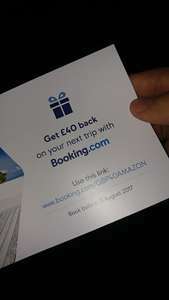 I booked a hotel with them where I was promised £15 cashback for going through a link provided by a friend and they said it had tracked through Quidco so wouldn't pay. Load of nonsense - I had gone through the link provided and whether it had tracked with QUidco had nothing to do with it. Just wonder how you went through a link provided by your friend and had it tracked through Quidco? No idea you probably best look on the T&C. Cashback type thing. I don't see why they wouldn't honor it. It's not like T&C says 'limited quantity' or something. Every hotel I've looked at so far is either "pay at property", or "LOW RATE - No Money Back"! Every hotel I've looked at so far is either "pay at property", or "LOW …Every hotel I've looked at so far is either "pay at property", or "LOW RATE - No Money Back"! I don't see why it wouldnt work if you pay at hotel. It's agreed price ahead of time. You also need to register details etc to qualify. Has anyone been able to use this with an existing booking? I booked 5 nights in Poland last week and haven't paid yet, but now I've seen this and don't know if I can apply it! Has anyone been able to use this with an existing booking? I booked 5 …Has anyone been able to use this with an existing booking? I booked 5 nights in Poland last week and haven't paid yet, but now I've seen this and don't know if I can apply it! You have to book though link so you'd have to cancel. Worked for me when I used late August. Cashback got confirmed 3 days after the hotel stay, they emailed and asked me to select a card to get the £40 cashback paid. Worked for me when I used late August. Cashback got confirmed 3 days after …Worked for me when I used late August. Cashback got confirmed 3 days after the hotel stay, they emailed and asked me to select a card to get the £40 cashback paid.Thanks OP. Was that pay upfront hotel? Finished your stay? I paid for my hotel still not seen anything. Was that pay upfront hotel? Finished your stay? I paid for my hotel still …Was that pay upfront hotel? Finished your stay? I paid for my hotel still not seen anything. FYI, I've used this offer for a hotel stay between 28th Aug - 1st Sep, and I can confirm that today I received my £40 credit. It is NOT a voucher, but an actual cash transfer on the credit or debit card that you've got set-up on your booking.com account. Hope this helps anyone who's still awaiting their cashback, and huge thanks once again OP! Emailed to me after they stay at 13:37 (leet) ? This was meant to expire at the end of august according to the original leaflet, but has anyone had any Amazon deliveries with a new leaflet with an extended deadline? This was meant to expire at the end of august according to the original …This was meant to expire at the end of august according to the original leaflet, but has anyone had any Amazon deliveries with a new leaflet with an extended deadline? It was with a prime now delivery, not had any in normal deliveries.